Kremlin ( , Kreml ) is the Russian word for "fortress", "citadel" or "castle" and refers to any major fortified central complex found in historic Russian cities. This word is often used to refer to the best-known one, the Moscow Kremlin , or metonymically to the government that is based there. Outside Russia, the name "Kremlin" is sometimes mistakenly thought of as being Saint Basil's Cathedral because of its distinctive environment, although this is not a part of the Moscow Kremlin. The name Kremlin (or Kreml) has been allocated to various Soviet Navy vessels during construction. In each case, the name was changed prior to commissioning. Vessels which have briefly carried this name included Admiral Kuznetsov and Ulyanovsk. Russia's presidential administration is located in the Kremlin. During the Soviet era the government of the USSR was located in the Kremlin, but now the Russian government occupies a building outside it. Sknyatino – underwater since flooding during the 1930s. 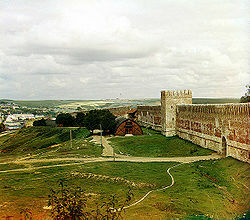 Many Russian monasteries have been built in a fortress-like style similar to that of a kremlin. For a partial list, see :Category:Monasteries in Russia.